Pratchett time again. 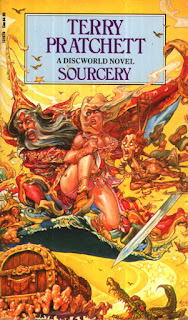 Having enjoyed the previous installment from the Discworld series a great deal, I had understandably high hopes for Sourcery. In addition, it would be revisiting Rincewind, a character that I hadn't seen for some time and who might hopefully get a bit more of an even characterisation this time around. In the Discworld, the eighth son of an eighth son is destined to become a wizard. The eighth son of a wizard, a wizard squared if you will, is destined to be a sourcerer, a source of new magic in the Discworld. When a powerful wizard breaks his vow of celibacy and creates a sourcerer in the process, the child makes his way to Ankh-Morpork and the Unseen University to claim the mantel of arch-chancellor. And the only wizard to stand in his way is Rincewind, the hapless protagonist from Colour of Magic and The Light Fantastic. I'm probably not going to make any friends saying this, but Sourcery is at best a mixed bag. It's a really weird thing, because I've been gleefully quoting parts of the story that amused me, and they were plentiful. But when I turned the final page and actually finished it, the overall impression that I got was kind of average. Thinking through it though, I can more or less pick out what did and didn't work so well. So, what worked? First, the asides are absolutely brilliant. These will be, for the most part, points where Pratchett puts the narrative on hold in order to explain a little bit about how the Discworld works. They are always amusing, and a lot of the time really interesting from a world-building perspective. For example, there's a bit about how ideas and inspiration work, where an idea is already formed out in the ether and must make an almost impossible journey through space and time in order to appear in the right head at the right moment for the inspiration to make everything fall into place. When it works, great things are done and understood. When it doesn't, you get a very confused duck with grand ideas about clean electricity generation, if it doesn't miss entirely. Stuff like that is great, and I think that I would have enjoyed Sourcery a lot less if there hadn't been as many of these witty asides. Second, there is the eternal delight that is the Luggage. It was by far my favourite part of the previous installments including Rincewind, and that has not changed in the slightest. It is still my favourite murderous walking bag of holding, and the little adventure/extinction-filled rampage that it has on its own is wonderful. More Luggage is always appreciated, especially when it's drunk. Likewise, the Horsemen of the Apocalypse were great, although not strictly needed narrative-wise. Now, onto the not-so-great parts. Firstly, the plot has a tendency to meander a hell of a lot more than some of the previous Discworld books. I mean, in Mort, the perspective was either with Mort, Death or briefly Albert. 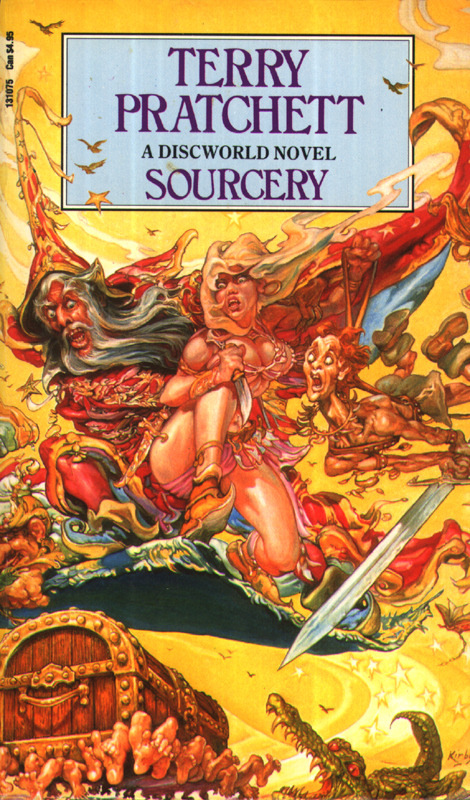 By the end of Sourcery, we had sections with Rincewind, sections with the non-magical companions that he meets on the way, sections with the sourcerer Coin and the Unseen University, sections with the Luggage, and sections with the Horsemen of the Apocalypse. Trying to keep all of these in check and equally interesting is not something that Pratchett succeeded with, quite honestly. If the plot had stuck to two, maybe three groups at most, it might have tightened the ending up and made it feel less anti-climactic. Secondly, the majority of the characters didn't really appeal to me. There's Rincewind, who I want to like more than I do. I mentioned in my review of The Colour of Magic that Rincewind probably wouldn't work as well without a character like Twoflower to bounce off of, and I think that Sourcery kind of proves my point. Rincewind is a character that needs a source of manic energy and recklessness to bounce off of, and when it isn't there it becomes a mystery what he's even doing in the narrative. Pratchett makes no bones about how much of a coward he is, so it just doesn't sit right with me that he continues to be involved in the plot after the initial reason for joining the quest is no longer an issue. As for the non-magical characters, I just wasn't impressed. Conina, the barbarian woman who just wants to be a hairdresser but can't resist getting into fights, should have been so much more interesting, but wasn't consistent enough characterisation-wise. Nijel, the skinny wannabe barbarian hero, was funny at first, but quickly became irritating. The less said about Creosote the better. The sourcerer, Coin, was probably the best character-wise apart from Luggage, as a ten-year-old with powers beyond anything anyone else can conceive and guided by a malevolent presence and will to use said powers. I wish there had been more of him, as opposed to the weak-willed wizards surrounding him, so he feels like something of a wasted opportunity.